A few weeks ago I watched a segment on CBS Sunday Morning on the new book Jan's Story. I've been thinking about Jan and her husband Barry ever since. "Imagine hearing these words: "She has Alzheimer's." Now imagine that "she" is vibrant, active, loving, healthy...and just 55. Acclaimed CBS News reporter Barry Petersen, writes about hearing the unimaginable: what it meant, what it still means, what he did--and didn't do--and how this beautiful love story needs to be read by the thousands of families who have already heard that same devastating diagnosis...EARLY ONSET ALZHEIMER'S. Jan's Story is a full, rich story of two people--and thousands like them--for whom "forever" suddenly and terrifyingly has an expiration date." 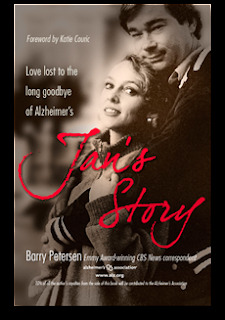 CBS Sunday Morning showed Barry visiting Jan and she didn't know him- the love of her life. This made me cry. What does it mean when your mind is gone? Are you still here? Clearly there is a person still living on earth, but is it you? If my mind goes with the terrible disease that is Alzheimer's, then I will consider myself gone, and I hope my husband will take me to an assisted living facility far, far away in China or New Zealand and pretend that I'm already gone and forget about my living body. Without my mind I am already gone. Without my mind I am no longer me, and I want my husband to remember me with my mind in all my glory. I feel the same way. If my mind's gone, send the body somewhere far away & don't visit me! Those are memories of me I would not want my loved ones to have. It's not like I would know the difference. Maybe a cure will be found before long. That's about the only thing hopeful I can say about it.